The practice seems a little strange at first - the sole purpose of a labyrinth is to walk the one-way path - there is only one, unlike a maze - into the centre of the labyrinth. Once you get there, you turn around and walk back the way you came. Labyrinths have been popular as a form of walking meditation for millennia. There is something about the walking that stills your mind. What seems a rather pointless exercise in terms of outward achievement is a space that helps to calm your chattering thoughts. This is more like exercise for your mind, rather than for your body, and though your mind might protest that it's dumb, it nevertheless helps to quieten those monkeys. Eltham - St Margaret's Anglican Church has a public labyrinth you can walk any time. It is housed on space that was once a tennis court. Lower Plenty - The Edmund Rice Centre, or Amberley, is a retreat and conference facility which has a labyrinth that is a full-sized replica of the famous one at Chartres Cathedral in France. It is available to walk by prior appointment. Langwarrin - the labyrinth at McClelland Sculpture Park is available year-round. A walk is scheduled at 1pm on Saturday, 3 May 2014 to celebrate World Labyrinth Day. Gardenvale - Tina from Labyrinth Lane in Gardenvale is running a guided labyrinth walk around the time of the autumn equinox - the time of year when it officially becomes autumn, when the days and nights are equally balanced. For $35 you will have an introduction to the labyrinth and a guided twilight walk through it, with time afterwards in which to journal and make art. Refreshments and music provided. 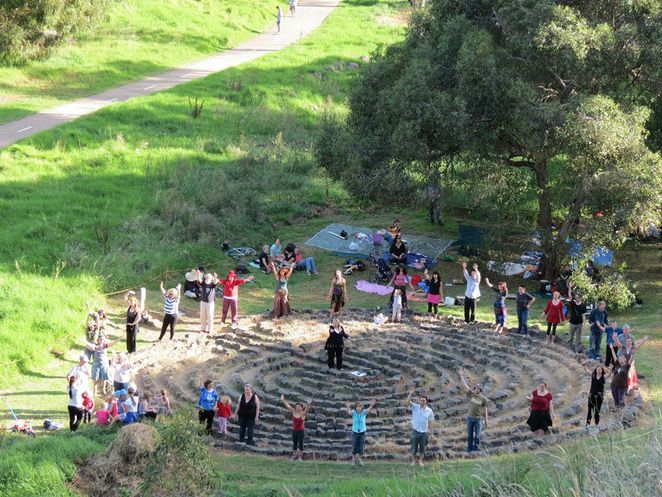 Clifton Hill - The Merri Creek labyrinth was created out of bluestone by the community, for the community. It sits in a beautiful spot in Clifton Hill and is available for a walk any time. Information extracted from Weekend Notes, a great site to plan your weekend activities.